Ok, so macro-raw doesn’t mean anything really but it is a term I made up to describe what I feed my family. I personally eat a high-raw diet but my family prefers some cooked food alongside their raw dishes. I’ve described what I make them as “Macro-Raw”. The cooked recipes are not really Macrobiotic but I do focus on making them whole grains with seaweeds, roasted root vegetables and other vaguely macrobiotic-inspired dishes. So why am I writing about Macro-Raw here? For a few reasons. Firstly, because I believe there are a lot of raw-foodists like me. You eat high raw and you want your family to eat high-raw too but maybe they don’t want to be as high-raw as you. As people concerned with our food we want to find a way to make eating raw foods easy for our families and want to make sure that the cook foods they eat are as nutrient-dense as posible. The second reason? Because as a Certified Health Counselor I just want people to get superfoods into their diet! The whole philosophy of Health Counseling is meeting people where they are and not forcing change but rather inviting it gradually through introducing new foods. I’m hoping that by offering some of the Macro-Raw dishes I serve my husband and daughter I can entice some people to try a raw dish when they may previously have found it inaccessible. So now that I’ve rather extensively explained myself, let’s get to what you all care about: some recipes. 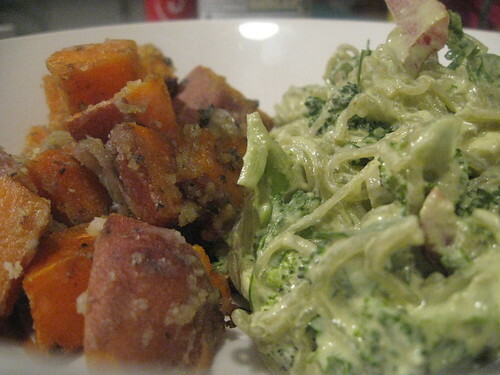 I’m going to share what I made my family for dinner tonight: Raw Green Curried Kelp Noodles with a side of Coconut Cream Crusted Sweet Potatoes. Preheat oven to 400 degrees. Toss all ingredients together and spread in 9″ x 9″ baking dish. Back for 40 minutes until sweet potatoes are soft and lightly browned. I can testify that both dishes were extremely delicious and made for a very satisfying meal! Oh no! We finished them at today’s lunch break! I’ll make it again soon though. I made an amazing tomato soup though with leftovers for lunch and a recipe for the blog! I do something similar with my family. They may have green smoothie with their oatmeal or a steamed shrimp in their salad. It is always great to create win/win situations.